if you would like to set up a special discount for families who have siblings, children of employees, military families, etc. When creating a manual invoice or a recurring tuition plan, your first line item will need to be the charge as it would be incurred regularly, without any discounts or subsidies involved. 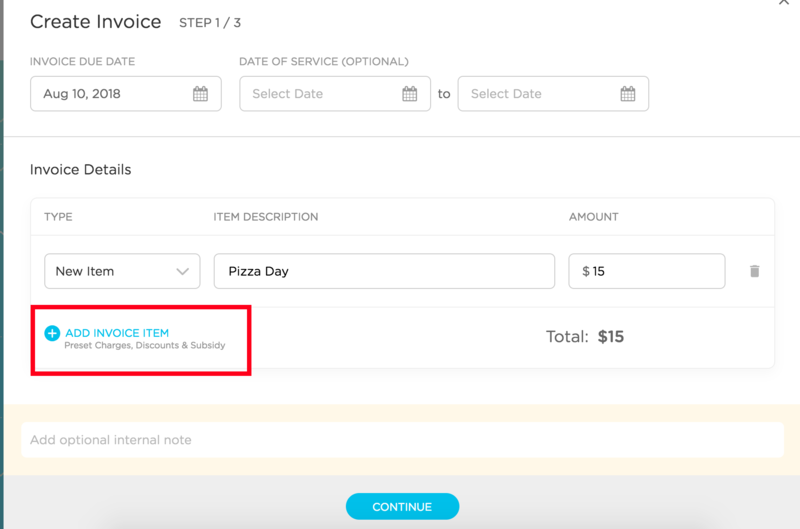 Once you have added that charge, you'll be able to add a second line item for the subsidy or discount which will allow you to alter the total balance of the invoice. Invoices may end up being $0 or have negative values in the balance after the discounts or subsidies are applied. Then select discount or subsidy from the drop-down menu. From there, you will be able to enter the amount. Note that you can switch between a fixed dollar amount or a percentage when applying the discount or subsidy. If you choose a dollar amount, that exact amount will be deducted from the regular charge. If you select a percentage, our system will automatically calculate how much of the regular charge amount to deduct from the invoice. 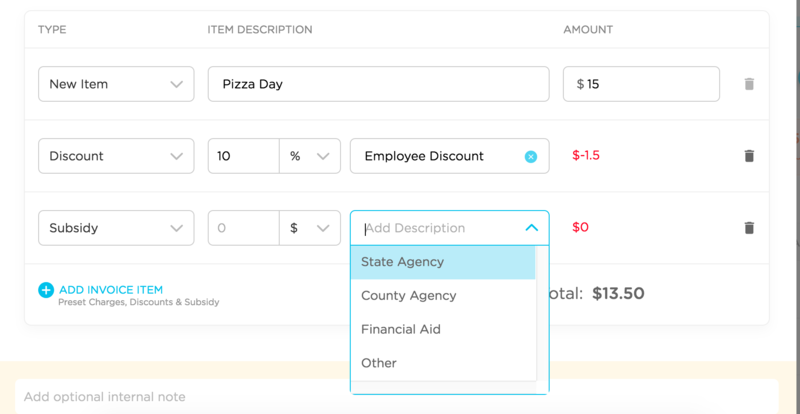 You also have a few options to select from the drop-down menu in the description field, which are different for the discount vs the subsidy. You can select one of these descriptions, or type in your own. The description field is required before moving on to the next charge or moving on to Step 2. Once you're done setting your charges, move to the next step to assign children to the invoice / tuition plan as usual.